The 15W Wireless Power Transmitter board, based on the dsPIC® Microcontroller, is compatible with Qi medium power receivers. The development board enables a system efficiency of about 80% at full load and includes status LEDs and LEDs for power level indication. Microchip's dsPIC® Digital Signal Controllers (DSCs) offer a strong feature set for wireless power/charging applications in multiple market segments. The devices include a powerful CPU core, multiple pwm generators and advanced analog modules, allowing the customization of solutions. The multiple pwms allow the control of the full bridge inverter and a front end Buck-Boost converter (required for fixed frequency topologies). In applications where the final solution requires the implementation of a proprietary protocol in addition to the standard, the dsPIC® DSC is well-suited because of its computation capability. The CAN/LIN feature in the dsPIC® DSC makes it a good fit for automotive in-car wireless charging. The software structure can be setup efficiently for wireless charging such that basic kernel functions are packaged in library form and add-on/customized functions (such as foreign object detection, CAN, I2C etc.) are provided as API interfaces. The Microchip Wireless Power Development Board is based on the Qi specified single coil, MP-A2 design topology. The image below illustrates the high-level block diagram of the Wireless Power Development Board. A capacitance of 247 nF (±5%) and an inductance of 10 μF (±10%) comprises the resonant circuit. These two components determine the analog ping frequency for mobile device/wireless power receiver detection. This board includes MOSFET drivers, MOSFETs, a current sense amplifier, power transfer/power LED indicators and an envelope detector for demodulation. The software state machine for the power transmitter includes seven distinct phases for communication and power transfer. When receiving messages from a mobile device, the power transmitter demodulates the Amplitude Shift Keyed (ASK) encoded messages. When communicating with a wireless power receiver (mobile device), the power transmitter uses Frequency Shift Keying (FSK) for message encoding. 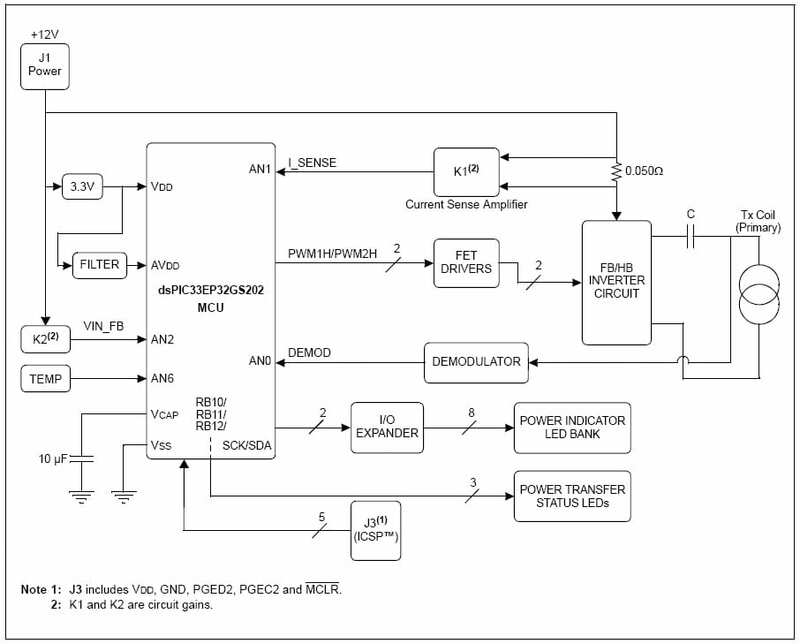 FSK communication from the power transmitter applies to v1.2.2 medium power receivers. The medium power transmitter is both Qi v1.1 (Low Power - 5W) and Qi v1.2.2 (Medium Power - 15W) specification compatible. The medium power wireless transmitter development board uses PI closed-loop frequency control for power transfer. The dsPIC DSC device provides the necessary memory and peripherals for current/voltage measurements, pwm generation, analog signal comparison, input capture and general purpose I/Os, eliminating the need to perform these functions with external circuitry. The dsPIC ‘GS' devices are specifically designed to provide design flexibility at low-cost. dsPIC ‘GS' devices for wireless power applications offer the benefit of additional on-chip resources for added design functionality based on system needs and limited only by designer creativity.